Bringing together the best of India, Masala chai tea and the healing tulsi holy basil herb, this organic chai blend is empowering and stimulating. 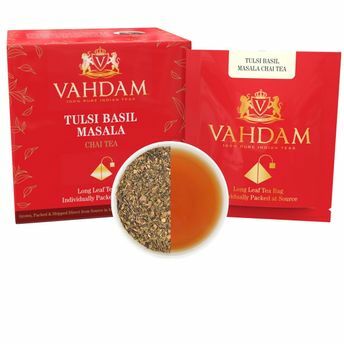 A unique combination of organic assam black tea, tulsi, cinnamon, ginger, clove, cardamom, black pepper, long pepper, bay leaves and nutmeg blended in suitable proportions. The flavour is rich and tastes of delicious spices with sweet undertones of tulsi.